Thanks for taking the time to read our review of the popular Hozelock Seasons multi-spray gun. This is the best seller online and there are many thousands of buyer reviews available for this particular hose attachment. This spray gun has an RRP of £19.99 but it is pretty easy to find this much cheaper online, and typically at less than half of that recommended retail price. Overall buyers have given this an average 82% buyer satisfaction rating, which is considered to be a very good overall rating for this type of gardening product. 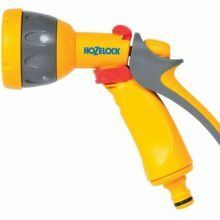 The Hozelock Seasons Multi Spray Gun has 5 spray patterns which are a powerful jet for cleaning, a fan spray for rinsing soap off cars, the fast fill for filling buckets and watering cans, a mist for gently watering seedlings, and a rose for gentle watering. For us gardeners some things are more annoying than others. Out of the wide array of gardening tools, the humble hose is probably one of those. In all honesty it is not so much the hose, as what is fitted to the end of the hose that causes the problems. Leaking, dripping and all of that is I agree a huge pain in the head. In this article I will be reviewing the popular brand Hozelock, and seeing what UK buyers have to say about the Hozelock Seasons Multi Spray Gun 2676 model. There are quite literally hundreds of these spray attachments to pick from. While that is great for competition and keeping the price down, it can make it more complicated to pick the best one for your needs. Gardeners all want something slightly different, and these can be used for watering plants, lawns, in the greenhouse and for other tasks like washing down a path, or even washing the car. So as you can see, these multi-spray guns have many uses, some intended and some unintended. Let's have a closer look at this one. As we mentioned earlier there are a few thousand buyer reviews of this particular spray gun online. That does mean that it sells really well and it is always a popular choice for many UK gardeners. We know the price and we also know how satisfied buyers are with their purchase. In this section we summarise what buyers have to say about their purchase. We find a good way to present this is in a pros and cons table. If the fit isn't right, then all spray guns will spout water out at the seals and around the tap area. This happens for 2 main reasons. Over time these will all go as washers wear down inside. The second reason is that if you try to match up different brands anywhere in the connection process, that just doesn't seem to work. Another popular problem with these is that when the tap is turned on, then the pressure can easily blow these off the tap. It is similar to the problems above. Getting the connectors right can be a matter of trial and error. There is a tendency for people to match and mix hoses, hose reels and spray guns from different manufacturers. 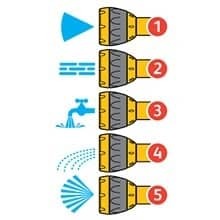 We would strongly advise doing this as even small measurements in each part can make a huge difference when connected together. It is also a reality that most people fit one of these to the end of a hose and forget about it. It is left out in all weathers including frost and snow, and that will weaken anything that is plastic. We do also tend to drag and accidentally drop these on the ground, and that of course will damage these. These are not criticisms of anyone, but just the reality of what happens to these. This is an affordable option that is a best seller online. It is not the highest quality but at the price we think it is very good value for money. The 5 sprays are enough for any of these types of spray guns, ad they cover a wide range of household tasks. The connection is good and the trigger has a nice feel to it when being used. The rear flow control also works pretty well. Buyers said that the lock is useful if watering for a long period of time. If this is not the spray gun for you, then it would be worthwhile checking out our top 10 list of hose spray guns. Overall though this is a good budget option for most home owners. if left out in all weathers these will usually need to be replaced about once a year.